Rock Basins are a rather cool erosion phenonema that are always intriguing when found. A shallow depression in an explosed granite boulder, perhaps started by the presence of a weeker feldspar phenocryst, is gradually attacked further and deeper by a persitent shallow pool of water. Once the frost and the wind get involved by eddying the water around in the basin scoop then the cycle gets ever more pronounced. Rock Basins sometimes end up drilling themselves right through the side wall, or even more impressively, through the bottom of a flat boulder, producing an impressively sculpted piece of stone that have been linked to druid ceremonies. 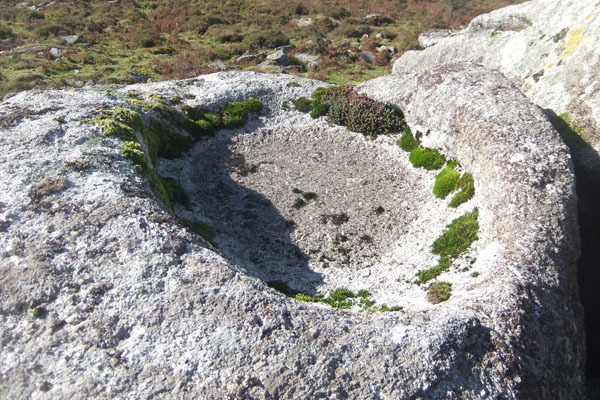 The Rock Basin here was found on the upper outcrop of Hucken Tor SX 551739, although the lower crags also have further examples. This entry was posted in Definitions, Geology, Mapping on 7th October 2017 by kiwinutz.